All the mobile telephony services (from now on referred to as the Service) offered by the web site “http://www.yoursms.gr” (from now on referred to as the Provider or We or Us) are provided to any of visitor or registered member (from now on referred to as the User or You ) under the following terms which determine the relationship between Provider and User. The use of the service means an automatic acceptance of the terms below. 1.1. Only these Terms and no other Terms apply to all Services the Provider offers to the User, unless the Provider agrees otherwise in writing. If the User uses the Provider’s Service, the User accepts these Terms. 1.2. The Provider keeps the right to modify these Terms from time to time without justification. If the Provider does so, will notify the User of any modification in advance via e-mail or through the website. If the User continues using the Services agrees to the modified Terms. 1.3. The User agrees upon Provider’s right to modify without prior notification the Service given that the Service’s nature and functionality will remain unaffected. The Provider can inform the Users about new services or changes of use given that they can be found fully justified at the FAQ page of the http://www.yoursms.gr web site. 1.4. The User is notified for financial and technical issues related to the Service by the internal mail of the User's page (private area), after logging in with his username and password. 2.1. 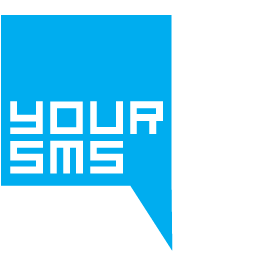 In order to use the Service the User will be asked to register to the YourSMS.gr platform. As part of the creation process the User will be asked to provide an e-mail address, create password, provide mobile phone number to which the activation PIN will be send to. 2.2. The User must provide true, accurate, current and complete information as requested during the account creation/registration process. 2.3. When the User registers for an account enters into an agreement with the Provider for an indefinite period of time. 2.5. Every Service is provided personally to each User and the ceding of the Service or its credentials (e-mail, password) to third party any way, with or without any kind of trade-off is prohibited. 3.1. Unless otherwise is provided by a more specific agreement between the Provider and the User, the User pays for the Services upfront by purchasing pre-paid credits. The purchased pre-paid credits will be added to the User’s account the User will receive an invoice from the Accounting Department. 3.2. The charges of the Service may change without prior notice. The maximum number of characters per message is 160 characters. Message delivery with more than 160 characters is supported (up to 480 characters per message), followed by the corresponding price increase (up to 3 messages). In the Provider’s website there may be external links leading to other websites of other services, which do not belong to YourSMS. Therefore the Provider does not offer any guarantee for the content or the activities of these websites and does hold no responsibility or liability of any kind for any damage caused to the User resulting from these websites. 5.1. When using the Services, the User shall comply with all laws and regulations applicable to the use of the Services and with these Terms or any other terms as agreed between us. which shall be determined at the sole discretion of YourSMS. 5.3. The Provider does not control or in any way intervene with the content of the User’s communications. Therefore the User is solely and fully responsible for the content of communications sent by the User or on the User’s behalf through YourSMS platform. 5.4. The User may not submit through our Services any social security number, passport number, driver's license number, or similar identifier, credit card or debit card number, employment, financial or health information, or any other information which may be subject to specific data privacy and security laws. 5.5. The User shall be held fully responsible for any damage caused to the systems of YourSMS during the use of the Services resulting from the User’s fault. 5.6. The Provider does not monitor or is responsible about information, data, images, sounds, messages or other material that the User sends using the Service and about any possible law or morality violation caused by that. The content of the messages to be sent by the Users making use of the Service does not express or bind the Provider who does not guarantee for its precision, integrity or quality. If the Provider become aware that during the usage of the Service a User violates the morality, the laws and rules that govern telecommunications or the rules of Internet (e.g spamming), maintains the right to deny to provide the Service and/or erase the User from the Service. This should not constitute a reason for the User or any third party to raise any demand for amends (monetary or not) for possible (positive or consequential) profit loss due to this reason. 6.1. You guarantee that you have obtained all required and valid consents from your clients according to the applicable data protection laws and regulations (such as the EU General Data Protection Regulation, GDPR) as required for the processing of personal data by YourSMS for the performance of our Services. 6.2. The User and the Provider both acknowledge that with respect to the processing of personal data on end-users that you provide to us through our Services, YourSMS is the Processor of Personal Data and the User are the Controller of such data. 6.3.6. at the choice of the Controller, delete or return all the Personal Data to the Controller after the end of the provision of services relating to Processing, and delete existing copies unless applicable low requires storage of the Personal Data. 6.4.3. sign our Data Processing Agreement, which shall apply in addition to and for the purposes of these Terms as well as any other agreement made between you and us. • to respond to an emergency which we believe in good faith requires us to disclose data to assist in preventing a death or serious bodily injury. 8.1. “Confidential Information" means: information maintained in confidence by a party, and which is marked as such, or information whether written or oral that by its nature would be to a reasonable person under the circumstances understood to be confidential information of a party. Details of YourSMS platform, supporting documentation, the Services, and the results of any performance tests of the Services will be regarded as Confidential Information. 8.2. Each party agrees that it will use the Confidential Information of the other party solely in accordance with the provisions of this Agreement and it will not disclose such information to any third party without the other party's prior written consent. Each party agrees to exercise due care in protecting the Confidential Information from unauthorized use and disclosure. Each party may disclose the Confidential Information of the other party, in whole or in part to its employees, representatives and subcontractors who have a need to know and are legally bound to keep such information confidential consistent with the terms of this Section. 8.3. The Parties are also required not to copy or reproduce Confidential Information in any form. The Parties are required to return, otherwise, upon request, after the end of their use, to destroy, in order to serve the terms of this agreement and after any termination of the present agreement, any material to which Confidential Information is incorporated, if the period that YourSMS is obliged to maintain them has past according to the Hellenic Authority for Communication Security and Privacy (ADAE). 8.4. You are solely responsible for the use of all passwords to the Provider’s systems as well as for maintaining the confidentiality and safe storage of them. All passwords are stored in the Provider's systems encrypted. You are responsible for all operations, or other activities carried out with the use of the password and/or username. Passwords cannot be transported or traded. 8.5. You shall be held fully responsible for any damage caused to the Provider resulting from any leak of information that has been marked as confidential and which was caused by your negligence or fault. 9.1. The Provider acts the best possible way to preserve the availability of the system at high levels 24 hours per day, 7 days per week. The access to the provided Services and their usage from the User takes place via the World Wide Web (Internet). There is the chance of no connectivity of the User to the Service for reasons beyond the responsibility of the Provider (e.g. no connectivity of the User’s ISP to the site’s address http://www.yoursms.gr, incorrect settings of the User’s web browser etc). In this case the Provider bears no responsibility for possible loss (positive, special or consequential which indicatively and not restrictively, alternatively or/and additively consists of loss of profit, data etc) that is beyond its capabilities. 9.2. The Provider forwards the User’s messages as soon as he gets them to the SMSC that the Provider uses. The successful delivery of the message depends on factors like the recipient’s position, the recipient’s signal strength at that time or whether he/she has his/her mobile phone turned on or off. The Provider bears no responsibility for any delayed delivery of messages if it is not due to the systems used by the Provider but instead is caused by the systems used by the mobile telephone company used by the User or by the entity that supplies the Provider with access to the mobile telephony network. 9.3. The Provider can deny to anyone, at any time the Service, if judges that, during or after being informed, there is violation of these Terms & Conditions, violation of the law or the morality or it is imposed by the proper and seamless function of the Service, the Service’s protection as well as in the case of the conviction of the User for misdemeanor related to the Service or similar services or in case there are penal charges against the User, related to the Service. 9.4. In no case the Provider bears any responsibility about possible demands of legal, civil and/or penal nature nor for possible loss (positive, special or consequential which indicatively and not restrictively, alternatively or/and additively consists of loss of profit, data etc) due to Users or third party because of reasons relative to the function or not and/or usage of the Service and/or due to possible third party access restriction to the Service available by the Service. • electronic communications sent by you that do not meet legal requirements or requirements set by telecom operators. • we failed to correct such breach within a reasonable space of time. 9.7. We shall be liable only for proven direct damages caused by our fault. We shall not hold any liability for indirect damages such as consequential damages, loss, revenue, profits, data, business, anticipated savings, and damages resulting from third party claims or any other damage caused by business stagnation. 9.8. YourSMS has no responsibility of following or checking the content that is stored or transmitted through its services and cannot guarantee the accuracy, validity or quality of this content. Therefore, the Provider does not bear any liability for any losses or damages of any kind caused as a result of the content transmitted by its services, since the content transmitted is the one that you have stated and has not been modified in any way by the Provider. 10.1. So called 'Force Majeure Events' may occur. A Force Majeure Event refers to an event, which does not depend on the will of any of the parties and which, even if it could have been foreseen, could not have been prevented. Force Majeure Events include, failure of a utility service or transport or telecommunications network or the internet, war, riot, civil commotion, fire, flood, storm or default of suppliers or subcontractors. 10.2. If a party is prevented by a Force Majeure Event from performing its obligations under these Terms and any other terms governing its relationship with us (the 'Nonperforming Party'), it shall not be held liable, provided that such Nonperforming Party has used all reasonable efforts to perform those obligations nonetheless and that it has notified us in written, with no delay, about the Force Majeure Event. • you have not used our Services for a continuous period of twelve (12) months or more. 11.2. If the agreement is terminated for any reason, the Provider will not have any obligation to refund pre-paid balance or credits. Amounts already invoiced to you, will become immediately due and payable. 11.3. The relationship between the Users and the Provider is governed by the Greek Law and the Laws of the European Union and responsible for the resolution of any argument relative to the Service that may arise is only the Courts of Greece.